like good food. Whether it’s a quick bite to eat with an old friend or a huge feast to celebrate a new marriage, we are all brought together by our love of food. Throughout Tad’s life, he has been surrounded by fantastic cooks who made wonderful, down-to-earth dishes. As a husband and father, Tad began his own journey of creating a unique spin on his favorite foods. This path led him to cook for family and friends—as well as thousands of meals for local church groups. For over 10 years he has been perfecting his debut sauce, Samurai Sauce, waiting for the right moment to share it with the world. Now is that time. Tad McBride is proud to offer everyone a taste of what he has been dreaming for so long. 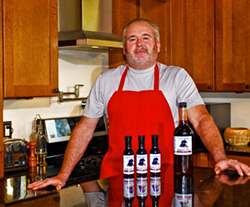 He is continually developing new sauces, and with these sauces, Tad wants to help bring communities together through great food. Eat well, Love people, Clean the dishes.